← ASFS Student Paper Awards! It was a busy and productive AAA Meeting for the Society for the the Anthropology of Food and Nutrition. Our section sponsored 13 panels, which included one poster session and a session of the AAA Task Force on World Food Problems. SAFN was able to sponsor three invited sessions, which brought together research interests in nutrition, culture and food justice. The SAFN panels that I sat in on were well attended. It is great to see continued interest in the Anthropology of Food and Nutrition. However, our program chairs Arianna Huhn and Joan Gross found 197 people presenting on food-related topics who were not members of SAFN. This made me realize that we still have a lot of work to do to recruit new members and expand our community of scholars working in the field of Anthropology of Food and Nutrition. During the meeting of the SAFN Executive Board, we talked about ways to attract new members and bring value to our existing membership. Next year we will be working on a creative membership drive which will include prizes for existing and new members. In addition, we will be working hard to build our community at the AAA meeting and throughout the year at events such as the Association for the Study of Food and Society meeting in Toronto that we will be co-sponsoring. In Denver, SAFN members discussed ways to support our graduate students working on topics in the anthropology of food and nutrition. First, the Executive Board unanimously voted to cut the price of student membership in half. It now only costs $10 for students to join SAFN. Second, we plan on organizing a mentoring roundtable event with senior scholars, early-career scholars and graduate students. Third, our section will be creating a new prize to support student travel for research. Stay tuned for more details on the SAFN Student Travel Prize. 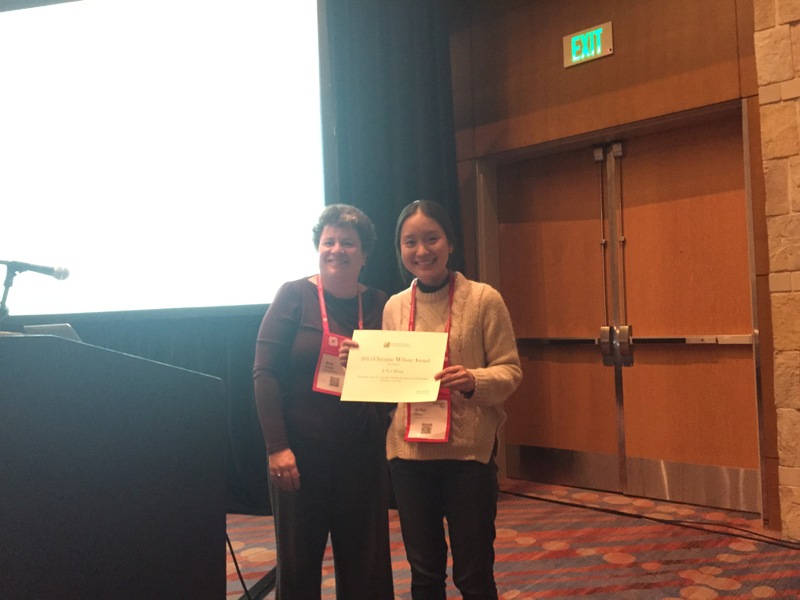 Amy Trubek, SAFN VP, with Ji Yea Hong, the winner of this year’s Wilson Award. This year’s Thomas Marchione Food-as-a-Human-Right Student Award went to Jessie Mazar, a student in the University of Vermont’s Master of Science in Food Systems. Mazar’s research focuses on issues of food access and food security for Latino/a migrant farm workers in Vermont’s dairy industry. The jury felt that Mazar’s work was very much in the spirit of Tom Marchione’s lifelong commitment to studying food as a human right. The SAFN reception at the AAA meeting featured a fabulous spread that ranged from fondu to bison sliders–perfect for a chilly November evening in Denver. Between bites and sips, SAFN members enjoyed catching up with old friends and meeting new colleagues. Our SAFN former president and Colorado native John Brett gave an animated talk entitled “Driven By Justice: Food Work in Denver”. For those of us who had spent the past four days in the Denver Convention Center, Brett’s talk was a wonderful glimpse of the outside world, focusing on some of the most dynamic local food justice initiatives taking place in the city.